You’ll find Seattle artist Erin Jorgensen right on the corner of waking and dreaming life, floating above her five-octave marimba and whispering elusive melodies amidst a cloud of sleepy radio snippets and atmospheric static. Or at least, that’s where you’ll find her this weekend. The Universal Language Project is proud to present Undertones: a concert experience that invites you to dream. The performances, which take place this Friday and Saturday, feature a rare collaboration between Jorgensen and pianist Cristina Valdés, one of today’s foremost interpreters of contemporary music. Curated by Seattle new music luminary James Holt, the concert is based on Jorgensen’s weekly podcast series of the same name, which is perhaps best used as a soundtrack for dreaming, staring out the window, or receiving outer space transmissions. The music blends together marimba melodies, improvisation, spoken word, radio scraps, found sounds, and anything else that happens to float through Jorgensen’s dreaming or waking life that week. The atmospheric podcast, which Jorgensen began about a year and a half ago, caught hold of Holt’s ear—and when Common Tone Arts asked him to curate a performance on their Universal Language Project series, all of the pieces came together. Jorgensen and Holt worked together to integrate these nebulous musical musings with additional solo piano music by three other composers. The result is an evening of music which seamlessly drifts between (and beyond) Jorgensen’s surreal musical subconscious and Valdés’s ethereal piano performances. At this weekend’s concerts, Valdés will become a part of that musical atmosphere with her performances of Ryan Brown’s softly twinkling “Ceramics,” Madeleine Cocolas’s interstellar “Static” and “If You Hear Me, I Hear You Back,” and two piano miniatures from Whitney George’s somber Extinction Series, which is comprised of musical obituaries for extinct animals. Though wide-ranging in their musical inspirations, each work connects back with Jorgensen’s original podcasts through a larger musical stream of consciousness. Of course, Jorgensen’s music presents an opportunity to not only look inward, but also far beyond ourselves—to quietly dream into distant galaxies and imagine the space between the stars. Though as Jorgensen points out, humans can’t actually hear anything in outer space, at least not in our traditional understanding of sound. Performances of Undertones are this Friday, March 31 at 8pm at Resonance at SOMA Towers and this Saturday, April 1 at 8pm at the Alhadeff Studio at the Cornish Playhouse. For tickets and more information, please click here. The Esoterics will celebrate the centennial of African-American Neoclassic composer, conductor, and professor Ulysses Kay. TSE shares 5 pieces written post-2000 from several different schools of composition, including a world premiere by Sarah Bassingthwaighte. JACK Quartet, deemed “superheroes of the new music world,” performs Morton Feldman, Ruth Crawford Seeger, Derek Bermel, Julia Wolfe, & Iannis Xenakis. w&ea. sings settings of Robert Burns’s texts and traditional drinking songs with an exclusive batch of Naked City’s “Scotch Wha Hae” Ale. A concert of new choral works on issues of social consciousness: technology, the environment, human & women’s rights, universal love, and perspectives on war & terrorism. Susan Maughlin Wood and Michaud Savage premiere works for string sextet with the Skyros Quartet, Rose Gear, and Michaud Savage. Pianist Dr. Brendan Kinsella & violinist Luke Fitzpatrick showcase elements of serialism & quotations in sonatas of Denisov, Shostakovich, & Schnittke. Composer/pianist Sumiko Sato premieres a series of pieces for sextet based on very old and historic recordings of Sakaya Uta (sake-brewing work songs). Inspired by a recent trip to Brazil, Chris Stover presents five new compositions for chamber jazz ensemble, spoken word, found sounds, and dancer. An exploration of three Soviet era composers (Rabinovitch-Barakovsky, Ustvolskaya, Karanov) who chart opposing paths during and after the Cold War. 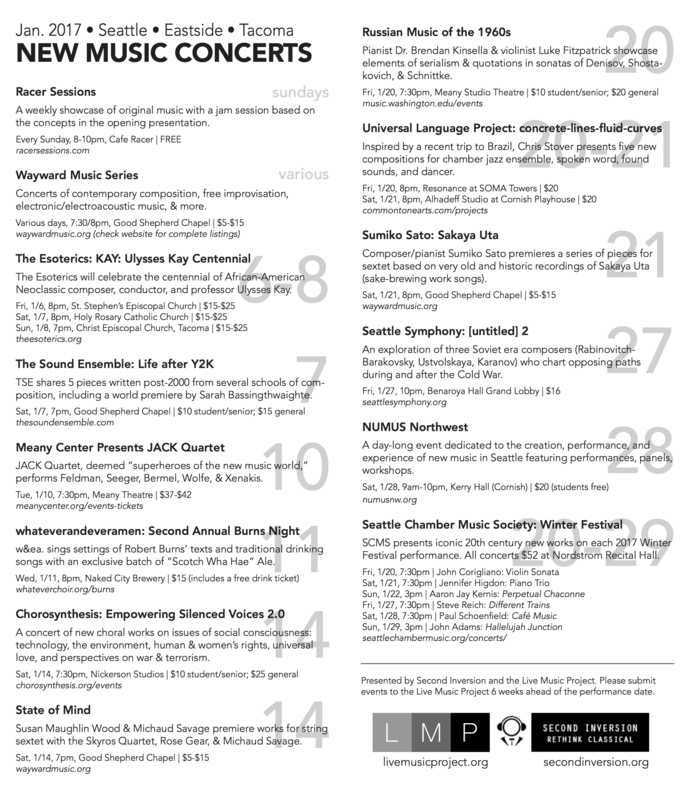 A day-long event dedicated to the creation, performance, and experience of new music in Seattle featuring performances, panels, workshops. SCMS presents iconic 20th century new works on each 2017 Winter Festival performance.